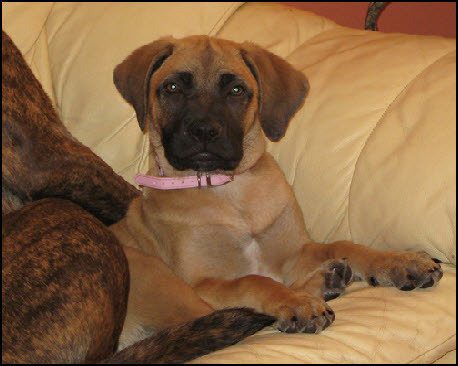 Angel was one of 8 four week old puppies that had been handed into rescue as the owner could not cope. They were small and undernourished pups and for quite a while it was touch and go as to whether they would all make it. But with much care and commitment from a dedicated foster carer they all pulled through. All but one have now gone on to responsible new homes. On a check up at the vets it was discovered that Angel had quite a severe heart murmer and so Debbie, UK Bullmastiff rescue co-ordinator decided that she would foster Angel and explore the options available for this little girl. Angel was referred to a specialist cardiology vets and was seen on the 17th April. Angel is booked in for her operation on the 1st of may …..the nearer to 16 weeks she gets before having the surgery the more chance she has of doing permanent damage to her heart …It cant be done sooner as the cardiologist needs that time to get a team together to perform the op . Angel will be kept in hospital for 2- 3 days ..depending on how she is ..the success rate of the op is very good ..he has only lost 2 dogs during the procedure in 10 years ..he has performed in excess of 100 ops . She will have a cardiology nurse with her around the clock to monitor her progress as post op can be a very tricky time . The operation depending on how much care she needs post op will mean a bill of between £1,500 – £3,000…. the rescue simply does not have the funds to pay for this operation. This is a huge amount of money but the only way of giving Angel a decent chance at life is by having the operation and so the only way we can raise the funds to pay for this op is by asking dog lovers around the country to offer a donation – no matter how small – even a pound will help towards the bill. If you can offer a donation then please make a paypal donation.